When it comes to exercise, you probably focus on the major body parts such as the back, chest, arms and legs. 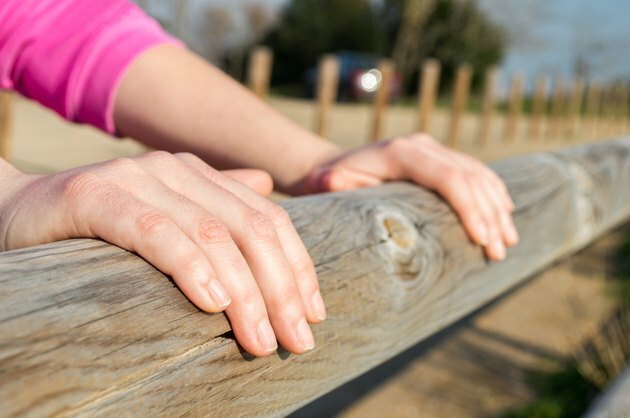 However, it is equally as important to strengthen your hands -- you need them strong to effectively grip, hold and squeeze so you can perform a myriad of daily tasks. Get strong, healthy hands with exercises that strengthen the muscles in the hand, as well as the fingers and wrists. Squeeze balls can be used to increase and improve hand grip strength. These small squeezable balls are usually about the size of your palm. You simply hold the ball in one hand with fingers enclosed around it and squeeze. Hold each squeeze five to 10 seconds, relax and repeat 10 to 15 times. Do this exercise three times a day for each hand. Your wrists connect your hands to your forearms and helps to keep your fingers in correct alignment. Increased wrist strength will strengthen the hands since the wrists help to stabilize the hands during movements upwards and downwards. Do wrist range of motion exercises in which you move your hand up and down daily. Start by resting your right forearm on a table with your wrist just off the edge and palm facing down. Stabilize your wrist with your left hand. Extend your right hand by moving it up towards the ceiling, hold for three seconds before slowly lowering all the way back down to point towards the floor. Return to neutral position and repeat 10 to 15 times for a total of three sets. Strengthen the muscles in the hand with finger-walking exercises. Do this exercise by laying your palm down flat on a table with fingers spread wide. Slowly start to walk each finger toward each other by lifting the index finger and moving it toward your thumb; repeat with the middle finger toward the index; fourth digit toward the middle finger and, finally, pinky finger toward the fourth. Then, repeat the series backward starting with moving the pinky back to its original position; fourth digit toward the pinky and so forth. Repeat 10 times a couple times a day. Strengthen your finger and hands by performing functional activities as exercise. Try picking up small objects such as pens, paperclips and rings; progress to larger objects that require more dexterity such as coffee cups and 2 to 3 kilo hand-weights. Repeat each exercise for a total of 10 to 12 repetitions or regularly incorporate into your daily routine a few times a day.